The John Shaw 700 ton vicing press acquired by South Devon Railway Engineering when it took over the business of R K Pridham Engineering and relocated their equipment to Buckfastleigh is now back in action. Our reporter caught it dealing with a relatively small job today for a customer. 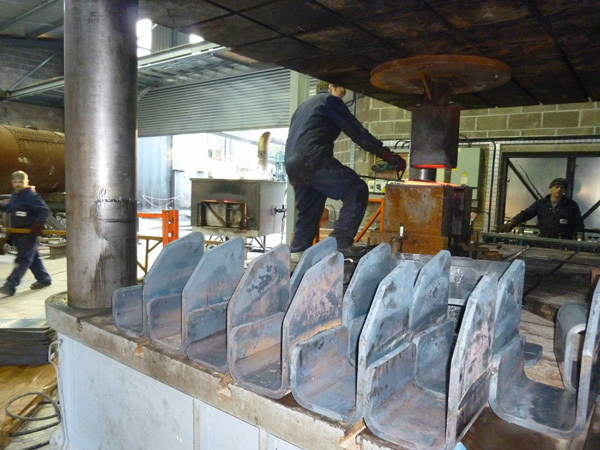 The picture shows a red hot plate being inserted into the necessary dies by one member of the team. In the left background is an oven in which the plates are being heated. In the right background another member of the team is controlling the press from the operating console. Finished pressings are sitting on the lower face of the press, which is capable of dealing with far larger items such as firebox backheads and so on. Now the machine is operational once more the next task will be to make a doorplate pressing for a Pacific locomotive. Work is continuing with the finer detail of setting up the new boiler shop, although the main structure is now virtually complete.